It is widely reported that the inventor of the top hat was a haberdasher by the name of John Hetherington, who in 1797 walked the streets of London in his new invention and caused a riot. Legend has it that women fainted, children screamed and dogs yelped at the sight of the silk top hat which had a ‘shiny lustre and was calculated to frighten timid people’. Although it’s a brilliant story, fashion historians actually believe the top hat is a descendent of the ‘sugar loaf hat’ worn in medieval times. The first top hats were made of beaver fur which was matted, pummeled and boiled until it resembled a felt that could be shaped and buffed to a shine. These models were soon replaced by silk top hats which were favoured for their elegance and stunning lustre – and these highly sought-after antiques are still considered the ultimate in top hats today. Their impressive shine, shape and lightness is the height of beauty and elegance, and second to none. Silk top hats were made with a unique fabric called ‘silk plush’ which has a long nap, giving the hat its high shine, which was stretched over a hard gossamer shell. In 1968 the only factory that produced silk plush ceased production, hence today there is a finite supply of silk top hats in the world. Their modern counterparts are instead made with a felt of wool or fur, or created in a similar method as their vintage silk counterparts but finished with ‘melusine’ fabric, which doesn't have the same sheen. From the late 1700s and through the 1800s top hats were ubiquitous, with gentlemen of all classes wearing them. But during the early 20th century, with increasingly informal attire, top hats gradually became saved for more formal occasions. This tends to be the case today - although in recent years the top hat has enjoyed a resurgence. Now, more than ever, modern gentleman regularly sport them for occasions such as the Derby, Royal Ascot, formal weddings and garden parties. In fact, here at Oliver Brown, our London store is often the first port of call for gentlemen seeking Royal Ascot top hats. 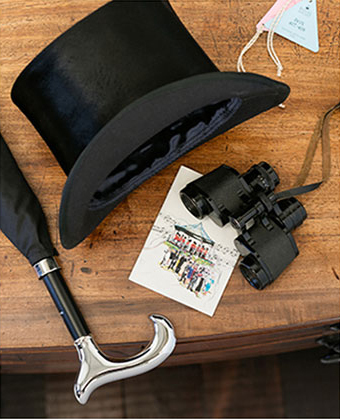 We’re also in attendance at the event itself, hosting a top hat area within the Ascot shop, for gentlemen wishing to buy their hats on the day. The dress code for the most exclusive of all the enclosures requires gentlemen to wear a top hat, so if you’re in, you’re wearing one! 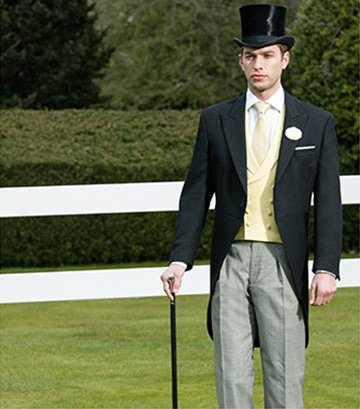 Although many race meets have adopted a more liberal dress code over the years, Royal Ascot retains its exacting standards, with gentlemen required to wear full morning dress in the Royal Enclosure, including a waistcoat and tie, plain black shoes, and of course a black or grey top hat.